Whew! 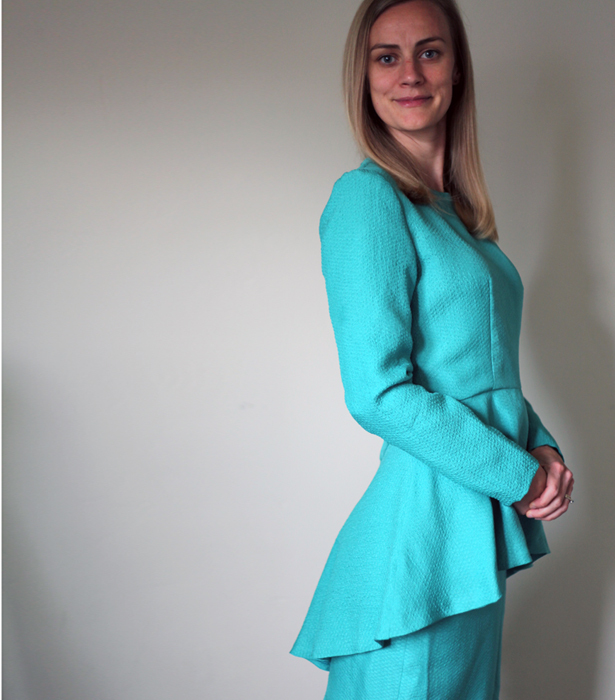 You have no idea how excited I am to finally have this peplum “dress” completed. It’s taken me over a month from prepping the fabric, to cutting the fabric, to putting in the last hand stitches. 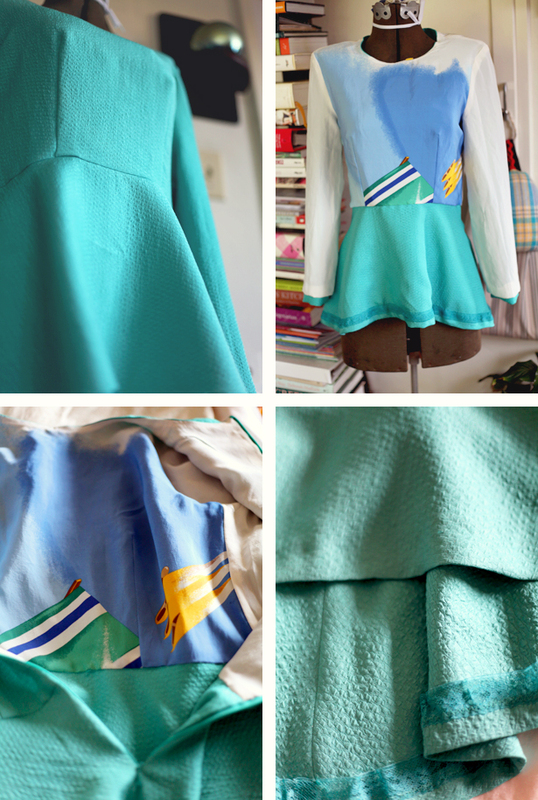 Since the peplum and skirt are actually two separate pieces, construction took twice as long as I expected. But, I did my best to not skimp on any of the steps – except maybe that last press to get the garment into ideal photo shape. Why not cut a corner here or there? Because this garment is actually destined to end up in the hands of my good friend J (who just ran a 2:50 marathon – go J!). But, what’s a pattern without great fabric? For the exterior I chose an Italian Carolina Herrera turquoise silk and wool blend covered in the most delightful puckers from Mood, which I bought with my Mood Sewing Network allowance. I pretreated the fabric by sticking it in the dryer with a damp towel and then giving it a good press to even out all of the puckers. It proved to be a tricksy one to press during sewing, but turning up the heat on the iron seemed to do the trick. For the lining I used a beautiful silk crepe de chine print also from Mood featuring a bathing beauty on the Riviera Italia. It was pretreated by hand washing with gentle shampoo and then line drying. I misjudged the panel repeat (closer to 37″ than the published 56″), so I was only able to use the print for the lining on the front pieces of the top and skirt. For the rest I used some ivory silk crepe de chine (no longer online, but similar fabrics can be found here) from Mood that I had left over from a previous project. Though I would have liked to have had a bit of the print on the back, I was very happy that the ivory base of the two lining fabrics matched perfectly. Again, I used my MSN allowance towards the purchase of these fabrics. 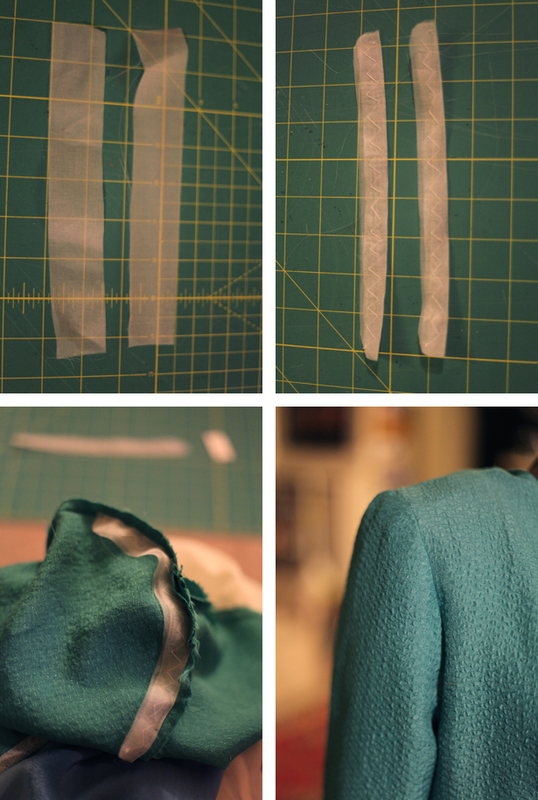 The most difficult part of the top turned out to be the last step: the peplum hem. I wanted to line the peplum with self fabric since it’s high-low hemline meant the lining peeked out quite a bit on the sides. I tried machine stitching the lining and exterior together, sort of like I was stitching a facing on to the hem, but it bubbled quite a bit. I then added lace hem tape and stitched the hem with running stitches all the way through the lining, grabbing just a tread or two from the exterior fabric. I thought these stitches were invisible because of the puckers, but when I took photos (one is above on the top right, another is two above on the top left), I noticed just how much the fabric again pulled and puckered. As always seems to be the case, the third try was the charm. This time I used a catch stitch, again going all the way through the lining and grabbing a thread or two from the exterior fabric. Though the hem lace now doesn’t sit flush against the underside of the peplum, the hem is nearly invisible where it counts – the outside of the peplum. The skirt was really straight forward. I practiced pressing nice darts and got to line my first kick pleat. My favorite part of the skirt has to be the lady in her red swimming cap on the lining. It’s fun to know such a proper skirt has a secret playful side to it. 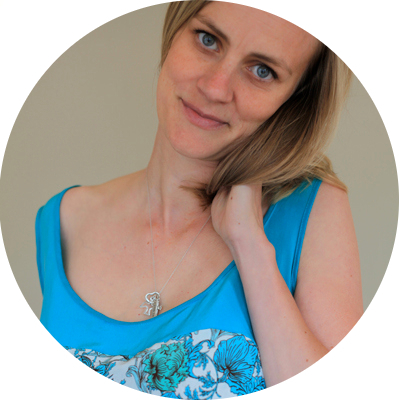 This post can also be found on Mood Sewing Network and BurdaStyle. Though I also mentioned it in the text above, I used my MSN allowance towards the purchase of the fabrics, and I received the patterns for free from BurdaStyle. Next Post The Ten Magazine Winners! Beautiful work, both inside and out! Love your fabric choices. Your friend is a lucky gal! Thanks. It was a lot of fun to make. J loves it! I just love when there is a little secret inside! Lovely suit. I do like putting in fun linings. It makes for a nice little secret. She actually got it this past weekend while she was home for Thanksgiving. She loved it! Gorgeous. Just gorgeous. I wonder what you’ll decide on when its time to make something peplum’y for yourself ! I think I’ll use this same pattern since I like the high-low peplum. Maybe a darker blue? wow this colour and the fun lining! you did and amazing job! such a great outfit! just beautiful. and u made it for a friend! wow ur a great friend! I bet she loved it? Yes, she did! And, thanks! What a lucky friend- this is lovely and so shapely! I really, really love this! It’s just so gorgeous! Your friend will feel like a million bucks in it! You must be so glad to be DONE! I hope she does. And, you better believe I’m glad to be done! So gorgeous! Your friend is going to treasure this! All the time and thought you put into the construction and the details is really astounding. And Congratulations on being done!! Thanks! It is quite a relief. This thing took forever! 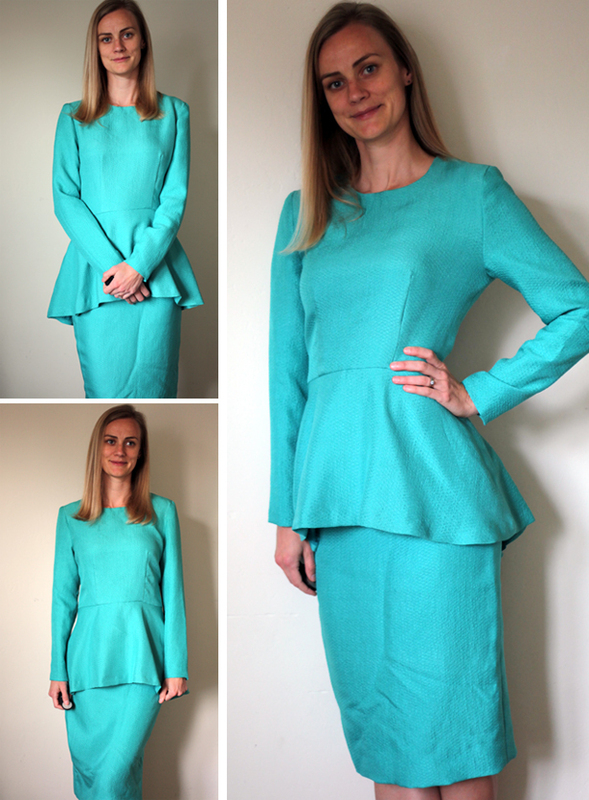 Yes, it’s J again — Amy’s lucky friend who is now the proud owner of a beautiful peplum dress! I ABSOLUTELY LOVE IT. I tried it on for my mother over Thanksgiving break and she thought it was gorgeous. And then her jaw dropped when I told her that a friend made it for me. I am so lucky. Unfortunately, my job has taken me hostage, so I haven’t had the chance to take pictures in it yet. But I definitely will, and hopefully Amy will be inclined to post them. You better believe I’ll post your pictures. But, I’m glad you’ll put your job responsibilities over taking silly blog photos! Glad you like it!!! Love this fabric and lining combination, and you did such a beautiful job sewing it up! I am always so impressed by your dedication and details. Lucky lucky friend! Thanks! It turned out quite well! I’m a bit behind in my blog reading but I really couldn’t wait to see this outfit. It’s absolutely stunning! And so fantastically crafted. I had no idea you were going to use such a fantastic lining. What an unbelievable gift this is–your friend is one lucky gal. Amy, I am now making this top. I was wondering what size you used…I muslined it yesterday and it’s awfully big in the rib-cage area and on the sleeves. I used the smallest size, and I still had to take it in quite a bit in both the side seams and the arm width and length. I never quite got it to the fitted shape I was hoping for, mostly because I was afraid to mess with the armsyce. If I were to do it again, I might shrink it when I was printing it out, and then just make sure the shoulder hit where they were supposed to and add back length to the bodice since I liked where the peplum hit.